The Errai or Gamma Cephei binary system is located about 45.0 light-years from Sol. It lies in the east central part (23:39:20.8+77:37:56.2, ICRS 2000.0) of Constellation Cepheus, the King and father of Andromeda -- southeast of Polaris (Alpha Ursae Minorus), northeast of Pi Cephei, Alfirk (Beta Cephei), Alderamin (Alpha Cephei), and the Garnet Star (Mu Cephei); north of Omicron, Iota, and Delta Cephei, and Caph (Beta Cassiopeiae); and east of Kappa Cephei. 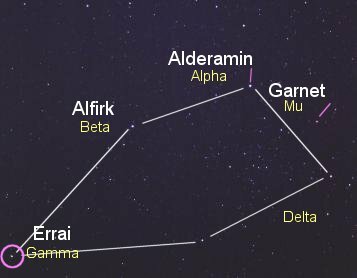 In the venerable Star Names: Their Lore and Meaning, Richard Hinckley Allen noted that its name Errai (or Er Rai) comes from Al Rai, "the Shepherd," a title of Arabia. Errai is an orange-red star of spectral and luminosity type K1-2 IV-IIIe, with CN 1 (McKeenan and McNeil, 1989, page 263). Spectroscopically, it appears to be "more typical" of a giant star rather than a less evolved subgiant (Bohlender et al, 1992; and Walker et al, 1992). The star may have 1.6 times Sol's mass (Klaus Fuhrmann), around 4.7 to 8.2 times its diameter (Klaus Fuhrmann; Walker et al, 1992; and Johnson and Wright, 1983, page 705), and 8.2 times its visual luminosity. The star appears to be from 89 to 186 percent as enriched as Sol with elements heavier than hydrogen ("metallicity"), based on its abundance of iron (Cayrel de Strobel et al, 1991, page 312). It exhibits "quite weak" chromospheric activity (Walker et al, 1992). Errai A may only be around three billion years old -- less than Sol's 4.6 billion years -- having evolved faster from a high mass than Sol, as possibly a much hotter, bluish white spectral type A star like Altair (Klaus Fuhrmann). According to James B. Kaler, hydrogen fusion at its helium-rich core may already have died out. Star A has a single-lined, spectroscopic binary stellar companion B with a period of 74 +/- 16 years in an eccentric orbit (e~0.44 +/- 0.06) -- with a separation varying from 12 to 32 AUs (Klaus Fuhrmann). Errai A is a variable star with the Catalog of Suspected Variable designation (CSV) 102274 and the New Suspected Variable designation (NSV) 14656. Useful catalogue numbers and designations for the star include: Gam Cep, 35 Cep, HR 8974*, Gl 903, Hip 116727, HD 222404, BD+76 928, SAO 10818, and FK5 893. 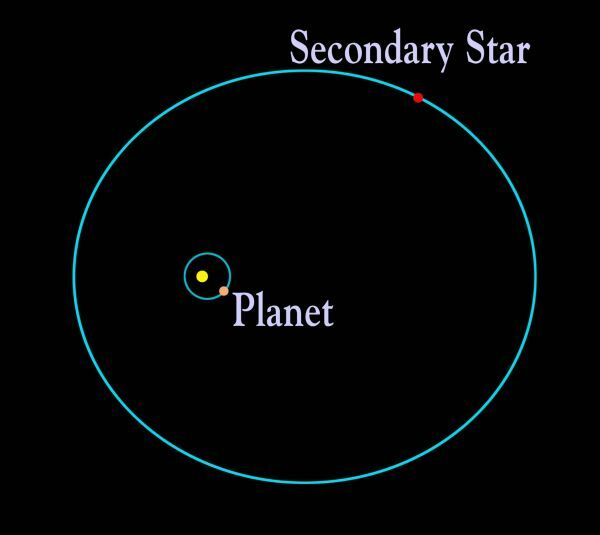 Based on a visual luminosity of 8.2 Solar and a mass of 1.6 Solar for Star A, the orbit of an Earth-like planet with surface water may be centered around 2.9 AU -- in the outer reaches of the Main Asteroid Belt in the Solar System -- and take over 3.8 years to complete. 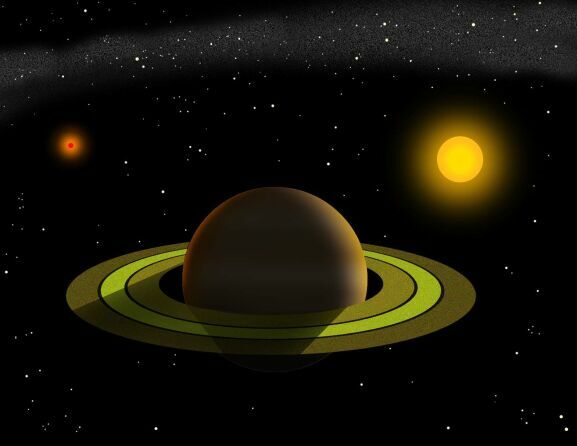 However, the giant planetary companion "A1" or "b" recently discovered around Star A could disturb the stability or the development of such a rocky planet in this orbit. 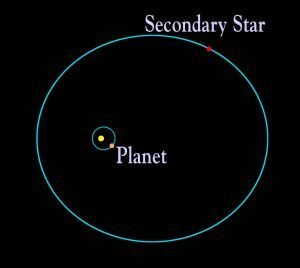 Astronomers would find it very difficult to detect an Earth-sized planet around this star using present methods. 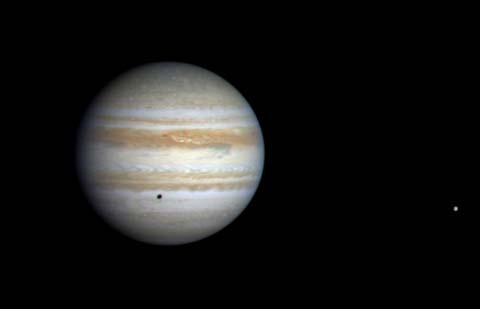 Jupiter (shown here with Europa). Errai B is suspected to be a much dimmer star than Star A. It may be of spectral and luminosity type MV given an estimated mass of 40 percent Solar and a surface temperature of 3,500° K (which is reddish in color). 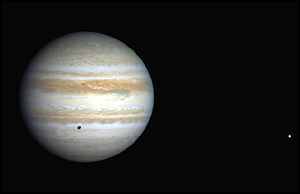 The star may have a diameter around half that of Sol's (Klaus Fuhrmann). The following table includes all star systems known to be located within 10 light-years (ly), plus more bright stars within 10 to 20 ly, of Errai. Try Professor Jim Kaler's Stars site for other information about Gamma Cephei at the University of Illinois' Department of Astronomy. Up-to-date technical summaries on these stars can be found at: Jean Schneiders's Extrasolar Planets Encyclopaedia; the Astronomiches Rechen-Institut at Heidelberg's ARICNS, and the Nearby Stars Database. Additional information may be available at Roger Wilcox's Internet Stellar Database and from www.alcyone.de's entry for HR 8974. In Greek mythology, Cepheus was a King and father of Andromeda, who was rescued from Cetus (the Whale) by Perseus who also married her (more). For more information about the stars and objects in this constellation and an illustration, go to Christine Kronberg's Cepheus. For illustration, see David Haworth's Cepheus.